What a unique name! No other blogger has ever been creative enough to come up with a theme that balances equal parts alliteration and accuracy. You must have majored in advertising, Sarah. And you would be right. 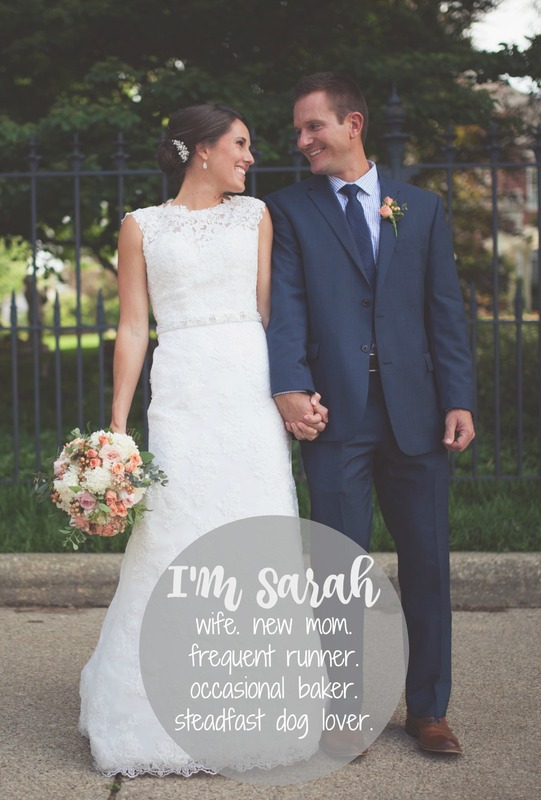 My experience in marketing might encourage me to call these posts Sweatin’ with Sarah or Muscles by Murph, but for the sake of time let’s just stick with the cliché. I typically spend more time working out than I do baking or photo-taking so I thought I would try to share a few of my workouts/observations and overall opinions as they relate to exercise with you on an occasional basis. Whether you workout regularly or not, my hope is that these posts resonate with you in some way and give you some inspiration to change things up. Let’s start with once a month and work up our endurance, shall we? Disclaimer: I am simply a girl who has spent a lot of time playing sports, running around Chicago and in the gym. Like anything on this blog, these posts are just my opinions and should not be taken in any other form. Exercise is an exercise in trial and error, right crazy weight plate guy? Years spent playing year-round sports left me with a void when I entered college. Like many students, I frequented the gym in an effort to maintain my fitness and offset the late-night pokey sticks. In between classes, I took a job at the local Rec center, a place that not only satisfied my love for sports, but one that brought me several great friendships that I still maintain today. Until recently, I was a total cardio queen. To spend 45-60 minutes of my workout on the treadmill or elliptical was pretty typical. When I moved to Chicago, I got bit by the running bug and never looked back. In doing so, I stopped lifting weights entirely. It wasn’t until I over-trained for the marathon last year and got injured that I was forced to cut back, literally. It took a lot of rest and rehab to snap me out of it, but I’ve learned it’s better to be a cardio princess than a queen. You know, less responsibility. Less cardio time meant more time for weights, something I used to love but never made time for. And with hindsight being 20/20, I now realize that my lack of lifting greatly contributed to my running injury in the first place. Now don’t get your calorie-burning pants in a ruffle, ladies. I’m not saying you shouldn’t do cardio. I am merely suggesting that you cut down your time and in doing so up your intensity. Would you believe me if I told you you could burn more calories with 25 minutes of proper intensity followed by weights than double the time just doing cardio? Math was never my favorite but I did take AP Calc my senior year when everyone opted for other electives so trust me on this one. It works. Having a certified athletic trainer as a boyfriend has its perks–one of which is a customized plan to get your body healthy again after injury. The catch? You have to put in the work. And in my case, with a “trainer” who is perhaps better suited as a drill sergeant, or green beret, or enforcer. Lucky for you I’m all about sharing, so in future posts I hope to offer some tips and shortcuts I’ve learned from my drill sergeant along the way. For now, let’s stick to the things I’ve learned on my own. 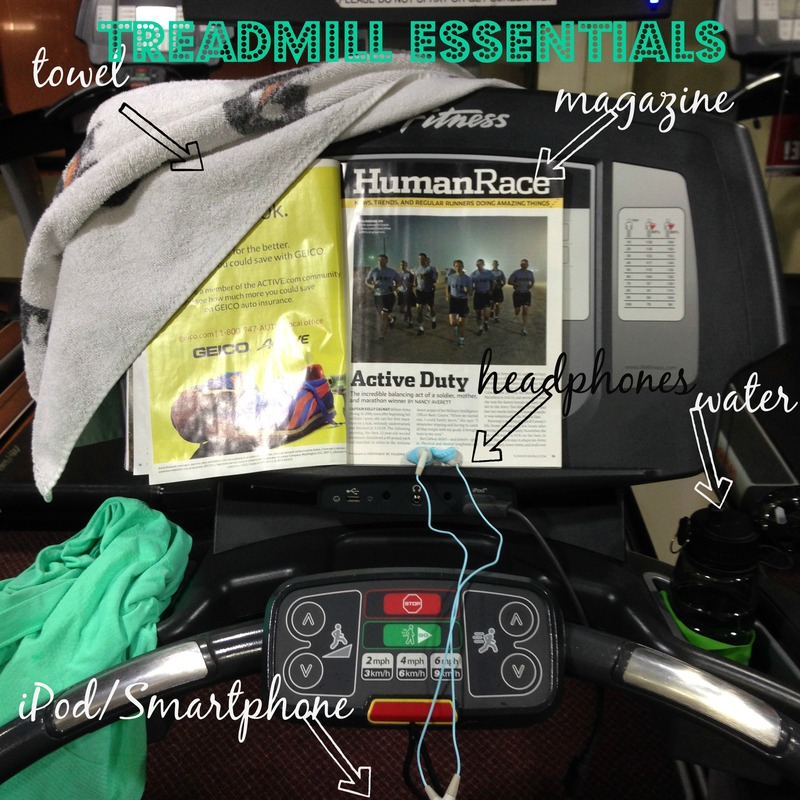 Today I’ll run you through what I believe to be the essentials for a quick treadmill workout. It seems only appropriate seeing as how most of our worlds are still frozen right now, forcing us inside for our workouts. So lace up those running shoes and let’s hit the rolling canvas thingamajig better known as the treadmill. Decide you are going to run before you get to the gym. Setting a schedule immediately increases your chances of actually following through with the workout. Unless I am training for something that requires more, I run on Tuesdays, Thursdays and Saturdays. I’ve found my body does better when I don’t run two days in a row. For the other days, I alternate between yoga, the spin bike or an elliptical workout and weights. Set your distance goal past where you think you can go. Again, unless I’m training for a race, I typically shoot for a minimum of 3 miles. No matter what, mile one always feels awful. I’ve found that if you tell yourself you are going to do 3, mile 1 doesn’t seem as intimidating and mile 2 goes by much quicker. Mix up your distances. In tonight’s case, I did 3 miles for the 3 Heath bar cookies I ate before I left for the gym. Oops! A large towel- Call me crazy but I like to bring my own towel to the gym. One big enough to cover the machine if I don’t want to see my distance and to cover the mat for stretching. Plus, you really need a big one to wipe all the sweat you’re going to produce in that swamp air. Water Bottle-be conscious of the spout so you can drink from it without slowing your pace or choking. A good magazine– I switch between Runner’s World and Cooking Light. Even if you can’t focus to read the articles, it helps to have a magazine to look at in case your treadmill lacks a television or adequate people-watching. Proper headphones– I love my YurBuds. So much so that I’m on my fourth pair because I have a profound ability to lose the left ear cover over and over. I would like to thank the YurBuds team for releasing a set specifically designed to fit our tiny woman ears. Go get yourself a pair. Music via iPod/iPhone or smartphone. I prefer using my iPhone lately. Specifically so I can listen to FitRadio while I workout. It’s free, it’s DJs and it will change your workout. Up the incline. I think this is fairly well-known, but putting your incline up to 1 percent is equivalent to running outside in terms of elevation. Do it right when you get on the treadmill and you won’t notice a difference. Otherwise you’ll be in for a treat when you try to match your distance in the real world. Cover up your treadmill. Use a magazine or your large towel to block the screen. Not focusing on your speed or distance will leave time for all those other things you need to focus on, like not falling off and breathing. Add intervals for your last mile. Intervals are a great way to fight boredom during the last mile of your run as well as a killer calorie burner. I typically do mine more by distance than time but either will work. Try to increase your speed by at least a minute/mile for 30 seconds to one minute, then slow it down for the same amount of time. So if you are running at a 9:15, increase your speed to 8:15 or faster during your interval sprint. Foam roll. Most gyms have a foam roll. It may take some searching but using a foam roll is a great way to avoid injury and release your muscles after a run. Be prepared for a few stares though. Not everyone is aware that some foam rolling positions can look similar to rehearsal for the call on me video. If you’re anything like me you get comfortable in your routines, your workout is no exception. Just trust me and give these tips a try. They will leave you more time to spend with the babies, puppies, cats, Chicago Fire and significant others in your life, though not necessarily in that order. How do you save time at the gym? What’s your favorite type of cardio? Do you stretch after working out? Did you see that guy photobombing your photo of Matt?? I honestly think he’s just stretching. Doesn’t look like a photobomb to me.